After writing signatures with our non-dominant hands, we agreed that the action was clumsy, unnatural, inefficient—and our signatures turned out distorted. 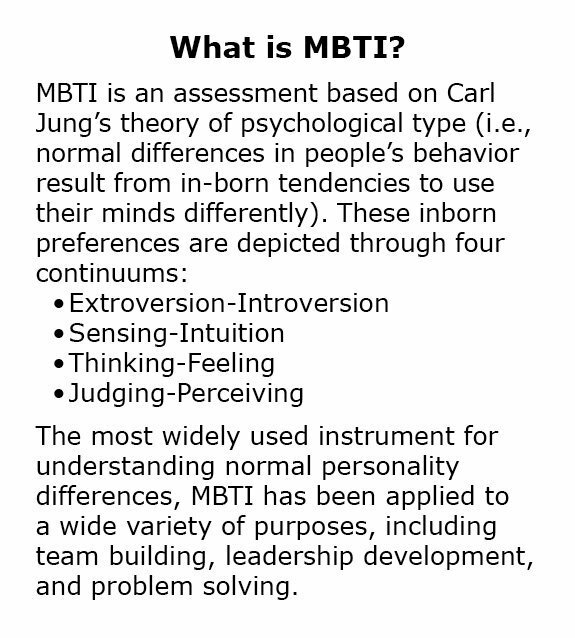 I was taking a certification course to become a facilitator in the Myers-Briggs Type Indicator (MBTI) with a group who primarily represented the helping professions (social work, education, counseling). One of my innate, left-brain preferences came vividly into focus during the week-long program. On Day 4 we delved into MBTI Step II, the facets (or subscales) of the four MBTI continuums, which revealed that despite having a solid Extroversion score, I prefer Introversion on one facet (Initiating-Receiving). That explained why networking or socializing in large groups puts knots in my stomach, but if someone reaches out to me, I generally enjoy conversing. During the Step II module, we distributed ourselves along a line in the room corresponding to facet scores. Our trainer divided us into three sub-groups based on how people clustered along the line and assigned discussion scenarios. When we got to the Thinking-Feeling facets, the sub-groups became lopsided with the majority clustered around the Feeling preference. I landed in the mid-zone group on two facets but mostly ended up in the smaller, logical-oriented groups. As we discussed how to select one of three solutions to a 20% budget cut, I quickly identified the flaws in each option and ways to improve them, while my partners worried about who would be affected by the budget slashing. They urged me to be our spokesperson. With dread I stood and confessed, “I think I’m an outlier. I instinctively saw flaws and limitations while my partners—who weren’t even sure if they belonged with me—cringed with my logical approach…” Jaws dropped when this go-along-to-get-along crowd heard me describe how my brain works when evaluating options. I felt like I’d just confessed, “I’m an alcoholic!” to a group of teetotalers. Although I felt somewhat vindicated by my trainer’s Challenger anecdote, the experience imprinted a painful—and important—personal insight: empathy is like writing with my left (non-dominant) hand. I admire how naturally empathetic people are gifted at making others feel good. 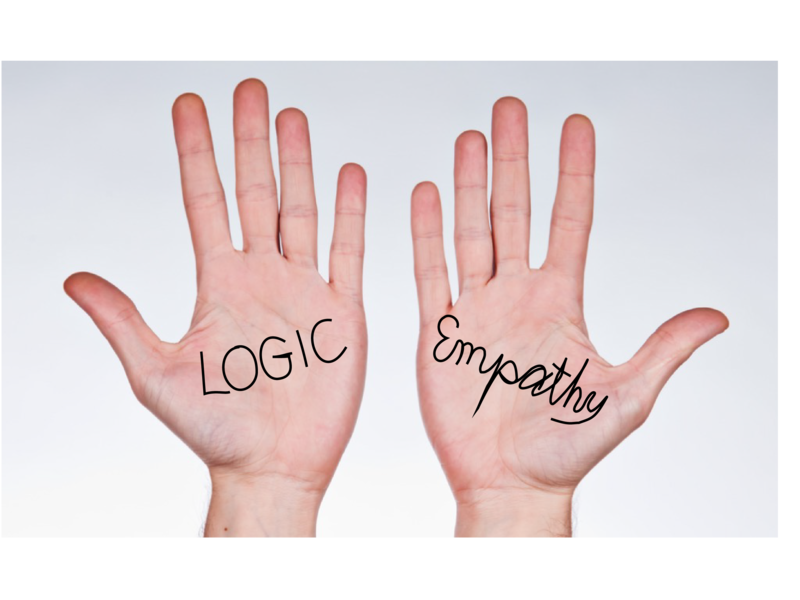 With conscious effort and practice, I’m learning to be more empathetic, but it will never flow as naturally or readily as my critical thinking. Reflecting on this episode also brings to mind the value of both critical thinking and empathy in work settings. 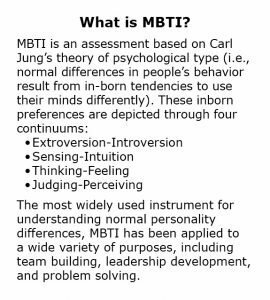 Teams Need Diverse Styles—Whether or not you’re a fan of MBTI, this story illustrates that what comes naturally to some is alien to others. More importantly, when such differences come together in a team, drama and discord can result because they touch on deep emotions and core values. However, when these differences are understood and valued, the team as a whole is stronger. Lopsided teams are vulnerable: too much logic can demoralize and too much empathy can overlook critical flaws. Visionaries, promoters, harmony seekers, practical thinkers, and executers all contribute to solving problems and driving change. Culture and Leadership—Cultural influences, such as the go-along-to-get along dynamic in the MBTI workshop, can suppress opposing perspectives and, in turn, stifle innovation. Similarly, command-control leadership styles often inhibits people from expressing points of view that differ from the leader’s. Ambidextrous teams who consider both human and logical implications and function in an open culture will be enabled to make better decisions. 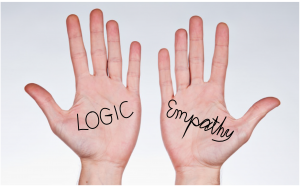 Logic Plus Story—As a predominantly logical thinker (with a strong “critical” instinct), I’ve discovered the value of stories to develop empathy. Research in neuroscience has shown that character-based narratives trigger the release of oxytocin, a hormone associated with compassion, empathy, and trust. A well-told tale brings us into a character’s journey—we experience the character’s struggles and transformation. Building skills in storytelling exercises empathy muscles. 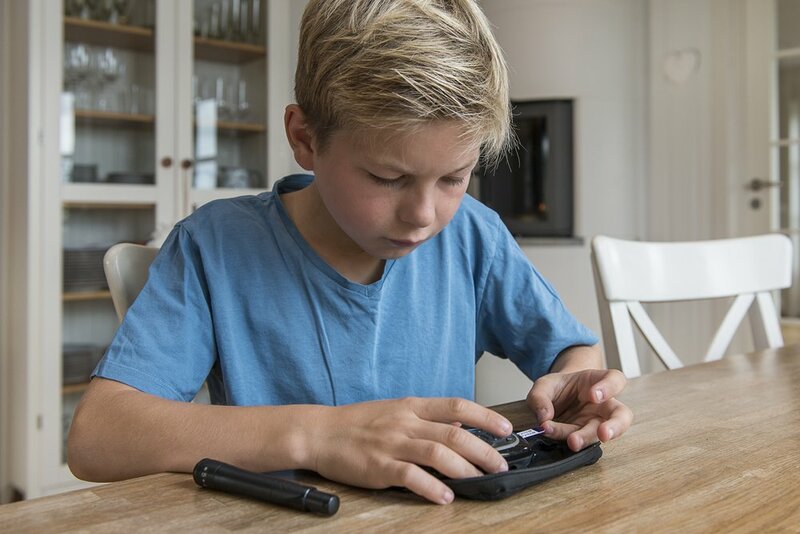 Plus, stories are a great tool for packaging facts in a emotionally compelling context.